I've been meaning to talk to you about our new addition all week. But, this week has been a huge adventure for us and I've been caught up in loving every second of it. We ended up going on a spontaneous trip to NC (spontaneous = decided to go and left 20 minutes later!) to surprise my parents for their anniversary. Big Daddy had to stay behind for work but I loaded the kids and headed south. It was loads of fun and I've got stories to share but first, meet Hurley! We adopted Hurley this past weekend and have spent this week falling in love with him. 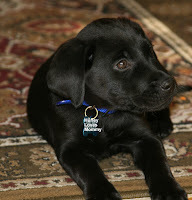 We've been wanting to get a lab puppy for a long time and when we saw him, we knew he was ours. Both kids adore him but let me tell you about the relationship he has with Jillian. She's been begging for a dog for so long. She falls in love with most animals right away and he was no different. She loves him in a way that has been so amazing to watch. The feeling is mutual, by the way. When she leaves the room, he follows her. When she comes downstairs in the mornings, he is beside himself to get to her. They have formed a bond so deep already and watching them together reminds us of why we wanted a puppy. Sharon has written Rules for Raising Daughters and one of those rules is about getting them a pet. (By the way, they are all worth reading. They totally changed the way I look at raising a daughter!) When I read it a year ago, I knew that she was right. Jillian is (like Sharon's sweet Jane) made to be a Doggy Mom. We have visited the local animal shelter almost once a week for the longest time and I can't tell you how many times we've left with her in tears because she wants to bring so many of them home. Watching the transformation in her in the last week has been nothing short of incredible. 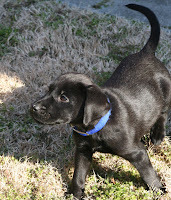 She's taking responsibility for Hurley, learning his potty cues, rewarding him and being very over protective of him. The only problem is reminding her that carrying him around like a baby isn't really going to work in a few months when he outweighs her so she should let him practice walking now. The first day here, he was afraid to walk off of the rug in the living room so he'd sit and whine until she came and picked him up. Again, it's all fine now but in six months when he's 50 lbs. heavier, not so much. J. is even falling for the little guy. He was the one who got up countless times with him the first couple of nights and patiently took him outside in the freezing cold. He kept him company while we traveled to NC and they had a grand time without us. Most of all, he's thankful for Hurley because our weekly trips to the animal shelter (with at least one of us crying) are over for a while. By the way, I know you LOST fans out there appreciate our tribute to Jorge Garcia with his name, right?